I would have preferred not to write to you. In fact, about a week ago, I put a post-it note on my computer monitor that said, “What would Skyman do?” (Skyman is my cat). It was supposed to remind me not to do things that Skyman wouldn’t do. Skyman would just wag his tail or wiggle his little nose and hope that whoever he’s wagging or wiggling to understands that he’s hungry, or lonely, or in love, or whatever. But he certainly wouldn’t write a silly love letter to the coolest girl he knows. Because he can’t form complex thoughts. And because he’s smart enough not to be so stupid. This evening, the post-it note fell off my computer monitor and landed on the floor. And although post-it notes usually lose their stick after a few days, this one was different. It was still really sticky and shouldn’t have come unstuck. And it was light green, which is the color of your eyes. These were obvious signs I couldn’t ignore. So, I decided to write to you… To tell you that Hanging by a Moment is a totally awesome song. That Diet Coke tastes better when you smile. And that the world seems slightly easier to understand today than it did yesterday. But still not as easy to understand as two days ago, when a friend and I shared a three-scoop 5 & Diner ice cream sundae at midnight. And decided that some people are like hot fudge and others are like hard candy. And I don’t remember why we decided that. But it had something to do with friendship. And ice cream with two spoons instead of one. And later that night, after I dropped you off, I wanted to call you to ask whether you preferred hard candy or hot fudge, just to find out whether you’d sigh and giggle simultaneously when I’d ask. Because that’s what I think you’d do. I didn’t call you because Skyman wouldn’t do that. He wouldn’t even know how to dial your phone number. Because a cat’s paws are not nearly as dexterous as human hands. Which must be nice for Skyman, because love is a lot simpler when you have paws. I wish you were here. Just breathing beside me. When Angel and I were first falling in love—as depicted in the story above—I went to my parent’s house one evening for some much-needed relationship advice. It just so happened to be my mom and dad’s 27th wedding anniversary the following day, so both of them were eager to reflect on what they had learned from each other and their relationship over the years. The advice they gave me that evening was truly wise, but even more important was the family ritual born that day. Every year since—now eighteen years and counting—I’ve pestered my parents (they love it) on their wedding anniversary and asked them for a new relationship tip or two, and I’ve recorded their advice in my journal. 1. Stand strong on your own, first. If your happiness is dependent on the constant validation and approval of your partner, then you are giving away far too much of your power. It’s human nature to want to be loved and admired, to want to be included, but it’s damaging to your self-esteem and emotional strength if it’s something you have to constantly beg for. The key is to nurture your own inner strength, then bring it into your relationship. Think of your relationship as a home you live in. Whether you like your home or not doesn’t depend on how the furniture is arranged—it’s how you arrange your mind. You have to decide to love yourself in it, and then radiate this inner love outward. All the love and validation you need is yours to give yourself. So the next time you feel pressured to be a people-pleaser, try taking a deep breath and reminding yourself that you don’t owe anyone your constant justification—not even your partner. Revel in the reality that you get to choose. You have the authority to decide how to spend your time and energy. And here’s the real beauty of it: when you don’t owe anyone anything—when you’re self-reliant—you’re free to give and receive love from the heart, without baggage. Come from this place of wholeness, of inner strength and independence, and then love your partner. Not because you need them to love you back, not because you’re desperate to be needed, but because loving them is a miraculous thing to do. 2. Maintain a solid foundation of mutual acceptance. Above all, acceptance means two people agree to disagree with each other on some things, and they’re perfectly okay with it. Differences of opinion, even major ones, don’t destroy relationships—it’s how people in a relationship deal with their inevitable differences that counts. Some couples waste years trying to change each other’s minds, but this can’t always be done, because many of their disagreements are rooted in fundamental differences in how they see the world and themselves. By fighting over these deep-seated differences, all they succeed in doing is wasting their time and running their relationship into the ground. So how do truly loving couples cope with disagreements that can’t be resolved? They accept one another as is—they understand that problems are an inevitable part of any long-term relationship, in the same way chronic physical difficulties are inevitable as we grow older and wiser. These problems are like a weak knee or a bad back—we may not want these problems, but we’re able to cope with them, to avoid situations that irritate them, and to develop strategies that help us ease the pain. When choosing a long-term partner, you will inevitably be choosing a particular set of unsolvable problems that you’ll be grappling with for the next 10, 20 or 50 years. And in many ways, that’s a truly beautiful thing. So just remember that the foundation of love is to let those we care about be unapologetically themselves, and not distort them to fit our own egotistical ideas of who they should be. And no, you won’t always see things eye to eye, and that’s OK. Sometimes you just need to choose to be wrong, not because we really are wrong, but because you value your relationship more than your pride. 3. Be intentional and fully present when communicating. Your partner is not a mind reader. Share your thoughts openly. Give them the information they need rather than expecting them to know it all. The more that remains unspoken, the greater the risk for problems. Start communicating clearly. Don’t try to read their mind, and don’t make them try to read yours. Most problems, big and small, within a relationship start with broken communication. Also, don’t listen so you can reply—listen to understand. Open your ears and mind to your partner’s concerns and opinions without judgment. Look at things from their perspective as well as your own. Try to put yourself in their shoes. Even if you don’t understand exactly where they’re coming from, you can still respect them. You can still put your phone away, turn your body toward them, and look them squarely in the eyes. Doing so demonstrates that you actually want to communicate and hear what they have to say. This reinforces the sort of supportive environment that’s crucial for the growth of love and respect in any relationship. 4. Face disagreements openly and with positive language. When disagreements in a relationship arise, the easiest thing to do is to run away, especially if you’re not a confrontational person by nature. But you have to catch yourself, because this isn’t just about you and whether or not you feel like dealing with your differences. It’s about what your relationship needs in order to grow and thrive in the long run. You have to put your relationship’s needs ahead of your own sometimes. Both people must be committed to dealing with disagreements openly, because running from them will only make matters more difficult to deal with down the road. On the flipside of running away, you also have to be mindful of how easily a disagreement can snowball into global attacks on your partner, and not on their decisions or behavior. For example: “They didn’t call me when they said they would because they forgot, but because they’re a horrible, wretched, evil person.” The difference is easy to discern, right? So, let’s take a deep breath when we need one, so we can deal with the reality we’re actually facing. One of the most simple and effective tools people in relationships can use to ease the process of dealing with disagreements is using positive language. Relationships flourish when two people are able to share their innermost feelings and thoughts in a positive way. An effective method of doing this during a disagreement is to do your best to avoid using the word “you” and try to use the word “I” instead. This makes it much easier to express your true feelings while avoiding the possibility of verbally attacking the other person. So instead of saying, “You are wrong,” try saying, “I don’t understand.” Instead of telling them, “You always . . .” try saying, “I often feel . . .” It’s a subtle shift that can make a big difference. 5. Let each other save face. My grandmother once told me, “When someone you love backs themselves into a corner, look the other way until they get themselves out, and then act as though it never happened.” Allowing someone to save face in this way, and not reminding them of what they already know is not their most intelligent behavior, is an act of great kindness. This is possible when you realize that people typically behave in such ways because they are suffering momentarily. They react to their own thoughts and feelings, and their behavior often has nothing to do with you. We all have unreasonable mood swings sometimes. We all have bad days. Giving your partner the space to save face, and not taking things personally when they’re occasionally upset, cranky, or having a bad day, is a priceless gift. Even if you are unquestionably right and they are unquestionably wrong, when emotions are flying high and you force them to lose face, you’re simply bruising their heart and ego. You’re accomplishing nothing but diminishing their worth in their own eyes. So just do your best to let them preserve their dignity when it makes sense. Give them space, let the emotions settle, and then have a rational conversation using the positive communication tactics discussed in the previous point. 6. Seek, support, and accept personal growth in each other’s lives. You know how to tell if something is alive and well? You look for evidence of growth. Healthy lifelong relationships contain two people who are committed to lifelong learning and growth. They’re curious about things. They’re keen to learn from the world and from each other. And because of their love for learning, they afford each other the freedom to develop as individuals within the relationship. Throughout a decade of coaching our students and our Think Better, Live Better conference attendees, we have seen many unhappy relationships that were caused primarily by one or both people being stubbornly clingy. In a nutshell, these “stubbornly clingy” people didn’t want their friends or partners to change. But here’s the simple truth: change is a part of the universe, and human beings are no exception. If you want to have a successful relationship, you’ve got to embrace personal growth with open arms, and all the changes that come with it. 7. Let love be a daily practice. This final point encompasses the previous six, and then some. In a healthy long-term relationship, two people love each other more than they need each other. Because of this, the relationship itself becomes a safe haven to practice love. And love, ultimately, is a practice—a daily rehearsal of honesty, presence, communication, acceptance, forgiveness, and heartfelt patience. Sadly, too often we forget the practicing part and we default instead to treating love like it’s a guaranteed destination we can jump to whenever we have time. We want to arrive at that “perfect” loving feeling in a relationship without putting in the work. And when it doesn’t work out that way, we assume the relationship itself is broken. But this is missing the whole point of a relationship—and the whole point of love. Again, love is a practice. It’s showing up for all the unexpected and inconvenient moments of a relationship, taking a deep breath, and asking yourself, “What part of love needs to be practiced here?” The answer will vary from one encounter to the next, in a continuous stream of tenderness, affection, and wisdom you could never have dreamed of or perfectly planned for upfront. Angel and I have been together for nearly two decades now—we’ve been through a lot together—and we love each other more and more with each passing day. And, I am convinced the relationship advice above is the reason why. It’s some of the best and most practical, hard-won relationship advice there is to tell. Talk to any set of grandparents—like my parents—whose relationship has withstood the tests of time, and they will tell you that the best relationships are not just about the good times you share, they’re also about the obstacles you go through together, the disagreements you compromise on, and the fact that you still say “I love you” in the end. And loving someone isn’t just about saying it every day, it’s about showing it every day through actions and behaviors, even when you and your partner aren’t seeing things eye to eye. And cheers to making true love last a lifetime! And, if you’re feeling up to it, I’d love to know what you think of this essay. 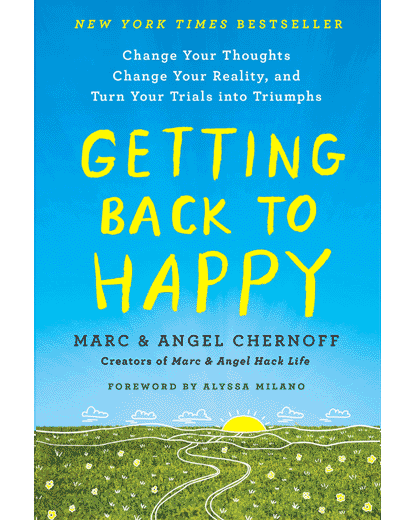 Also, our New York Times bestselling book, Getting Back to Happy: Change Your Thoughts, Change Your Reality, and Turn Your Trials into Triumphs, is now 36% off on Amazon! Thank you for this story. This resonated w/ me as I think about my wife–whom we lost three years ago–to Alzheimers–she was so young, diagnosed at 54. We had just “celebrated” our 45th anniversay on Dec 7 that year and she passed on Jan 7, just 66 years old. I totally agree with all of it. I have been blessed to be with my husband for over a decade now. I was asked the other day how to get the fairy tale and make it last. I responded that the bad times are part of the fairy tale so you enjoy the good times that much more. It’s hard work and worth every moment we fight for it. I always find that couples who have been married for decades always say that same thing.. “marriage is hard, but it’s worth it..” however they never say what hard means! Could you elaborate? I didn’t grow up with 2 parents and sometimes I fail to accept perhaps some realities or “hard” moments as normal? If that makes any sense. it would actually be nice if Marc and Angel wrote about the hard stuff .. those realities as well. What a beautiful opening letter. This advice is priceless too. But I’m especially drawn in to the idea that the universe blinks in the time our lives start and end. What a profound statement, and one that reminds me that life, really, here is short. And that now IS the time…for whatever it is in our lives we want to do (write that letter to someone special, experience life, find our deeper meaning, etc). Now is the time. That is all we truly have. Skyman…he had it figured out…it doesn’t have to be complicated. Life is….what we make it. PS. I’m just finishing up your GBTH book in our weekly book club, and I have to say I’m rocking and rolling with a couple healthy daily rituals. Thank you for all that you two do. I truly appreciate it, Marc and Angel! I ran across your blog just a couple weeks ago and subscribed to your weekly emails. I’d like to say that it’s incredibly beautiful how the two of you run this blog and write together. My husband and I have been together for 40 years next month, and I can relate to the love you two share. I also agree with everything you’ve stated here. Your parents are wise souls, and so are you and Angel. My 45th wedding anniversary is coming up next week. Your article and the wisdom in it are spot on. Thanks for sharing. It is very interesting to read this essay and finally understand what I already know but I couldn’t get through my relationships which I considered all failures. They all taught me something valuable, so it is a win for me. I chose to see it that way. I understand now Angel what you said about this article to be a really good answer for my question about loyalty! Thank you very much to both of you! Yes, I really enjoyed reading this. I know Skyman. This falls right in line with my philosophy on life. The most beautiful thing I’ve read on love in a long while. Every word worth taking note of. Thank you for the most precious advice. Taking the time to read this post this morning was time well spent. We have been married 55 years and this article was “spot on.” How wise you are. A dear friend who lost her husband gave this advice…. Remember The Best, Forget The Rest! Thank you for sharing your wisdom. First of all I like your writing style. It doesn’t sound like a technical handbook, but a tender, assertive, down to earth guide, which teaches the importance of personal boundaries, the importance of not giving your personal power away, a better way to understand that harmony in a relationship is combined of the ups and downs. Keep writing, you two are making a difference in other people’s lives. So looking forward to talking about it and what his feeling are about it. If one person in the dynamic of a relationship has to “lower their expectations” and try a new avenue of changing the thought processes and approach in the duo…how does it really work when it takes two? When you finally decide it’s enough with all the broken promises….the hardest part…is seeing how good it can be, until they are not…you know it exists…it leaves you feeling like you’re the problem and I know I am not…he just doesn’t communicate with me and it’s hard playing ball if the other won’t throw the ball back. This is WONDERFUL! I don’t know how you manage to write such amazing, inspirational articles on such a consistent basis. My wife and I celebrate our 20th wedding anniversary next year and we already put some of your wisdom into our relationship though there is always room for improvement. Thank you so much for being such an incredible resource. Marc and Angel, thank you for this article. My husband, Ken, and I always would tell newlyweds that one of the keys to a long and happy marriage was ” Give 60%, and take 40%. That leaves the extra for the hard times”. I lost Ken 6 years ago to a recurrence of throat cancer (after 44 wonderful years). Many times a day – every day, I think how much I miss him and wish he was here breathing with me. Thanks for all your wisdom. I always read your stories.. Sometimes quote it on facebook. This is the one blog i haven’t removed myself from.. You guys always seem to give the most realest, most rational, easiest, plain and simple advice. Thank you for sharing your life/love story. It seems that i can always relate to you. Thank you for this specific story. I sent it to my other half. (Not something i usually do as we don’t do the cheesy relationship things). I used to be in 2 broken relationships, abused and battered, managed to pick myself (and kids) up and move forward in life. Then I met my Mister.. It wasn’t always rosy. He also went through 2 divorces. So we both had walls. Huge walls. As our relationship grew I realize that there is no such thing as a perfect relationship.. We had / will have our ups and downs but (AND A HUGE BUT) We grew to love each other without any assumption, no expectation,, we just love each other and with love comes respect, trust, hope, companionship, best friends and so much more. I could say I am very lucky, but I feel more blessed. Toxic relationships are never love filled nor happy. Toxic relationships are stressful and not good for health, it’s like consuming spoiled, toxic food. Who wants to knowingly do that? A loving relationship is knowing both people can discuss anything and that needs be fulfilled to best of partners ability, the best they can and not ignoring partner. Just as there are beautiful marriages and relationships there are also toxic, bad for your health relationships and we all know what to do in the end, Let Go and Move On and learn what relationship taught you. There is peace and love in all of us. It’s a blessing to have someone who would want to hold hands and go through all seasons with you regardless of ups and down. Reading about you guys makes me happy. Bless!